Steven (Chicagoland, United States) on 22 September 2009 in Cityscape & Urban. Cloud Gate (The Bean) seen in the foreground left with buildings along Michigan Avenue: the Smurfit-Stone building (diamond rooftop), Trump Tower (to the right of Smurfit-Stone with the spire). The Chicago Cultural Center is front and center, dwarfed by those buildings that surround it. Barely visible in the upper right-hand corner is the Prudential Building. Photo taken September 13, 2009. Wow ! A powerful and so eyecatching HDR ! Very well done. It suit so well cityscapes ! Brilliant HDR! Very well processed! Super! Very well processed, belle couleur et ambiance ! 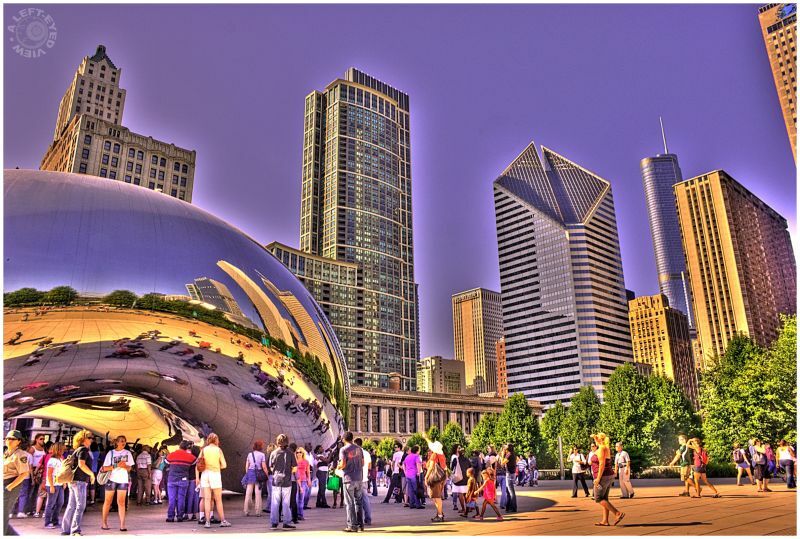 The Bean is badass, nice HDR too. Oh I love this HDR work. I've now got a copy of Photomatix any hints and tips on how to get the best from it? Do you use multiple images (bracketed) or make copies of one image in various exposures/levels? Amazing work and colors here ! Just seen your message it is quite amazing that you find times with nobody around this modern wonder. A wonderful HDR that brings justice to this attraction. Nicely done. I have been to Chicago once a few years ago, but this was prior to my DSLR days. I think I'm inspired to revisit and have a photo shoot with The Bean! wow -- this HAS to be one of my all time favorites of yours!!! the composition is STUNNING! (faaabulous light and color too!) :) 5 stars -- bravo! !